Be the first to share your favorite memory, photo or story of Lovelene. This memorial page is dedicated for family, friends and future generations to celebrate the life of their loved one. 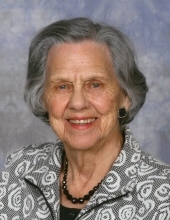 Lovelene DeHart Wade, 92, of Martinsville, VA passed away on Saturday, January 12, 2019. She was born on February 13, 1926 to the late Clyde W. DeHart and Myrtle Stone DeHart. In addition to her parents, she was preceded in death by her husband, Jesse Harold Wade, Sr.; sisters, Linda Morris and Jean Ball; and brothers, Bobby C. DeHart and Garland DeHart. Mrs. Wade was a member of Chatham Heights Baptist Church and worked as a homemaker. She is survived by her daughter, Sue Wade Goodall and husband Larry of Midlothian, VA; son, Jesse H. “Sonny” Wade, Jr. and wife Gayle of Axton, VA; sister, Marie Cook of Eden, NC; brothers, Letcher DeHart of Martinsville, VA, Billy DeHart of Calloway, VA, and Richard DeHart of Collinsville, VA; grandchildren, Jess Wade and wife Emily, Danny Wade and wife Kristina, Greg Wade, and Jessica Clift and husband Adam; and great-grandchildren, Cedar Wade, Gus Wade, Jack Wade, Archer Wade, Jay Clift, and Lydia Clift. A funeral service will be held at 2:00 p.m. on Thursday, January 17, 2019 at Chatham Heights Baptist Church with Rev. Dr. Michael Hatfield officiating. Visitation will be from 1:00 p.m. to 2:00 p.m. prior to the service. Burial will be at Oakwood Cemetery. In lieu of flowers, memorial donations may be made to Chatham Heights Baptist Church, 1235 Chatham Heights, Martinsville, VA 24112. Norris Funeral Services, Inc. and Crematory of Martinsville, VA is serving the Wade family. To send flowers or a remembrance gift to the family of Lovelene DeHart Wade, please visit our Tribute Store. "Email Address" would like to share the life celebration of Lovelene DeHart Wade. Click on the "link" to go to share a favorite memory or leave a condolence message for the family.